Dr Pienaar, then a young obstetrics and gynecology resident in South Africa, was engrossed in a patient chart when he walked onto an elevator in his South African hospital in 1992. He didn’t look up as he pushed the button. Instead of exiting onto the gynecology floor, he found himself one floor up — on pediatrics. And there in front of him was a poster promoting a speech the next week by a visiting British Columbian doctor. He couldn't believe his luck. An avid skier, Dr Pienaar had for months been trying to find out how to apply for medical positions in BC. In the days before the Internet, he spent months trying to get more information, even sending off dozens of letters to random BC hospitals with no reply. “I thought, ‘Well there you go! l will come listen to this guy and ask him!’” he remembers. The speaker was Dr Darryl Vine, an OB/GYN who just happened to be about to retire from his practice in Prince Rupert. When Dr Pienaar talked to him after his speech, Dr Vine offered him his job on the spot. “And that was that!” says Dr Pienaar, who arrived in Prince Rupert on December 31, 1992 with his wife and three small children, a fourth being born after their arrival. “Someone picked us up at the airport and said, ‘It’s New Year’s Eve, come to a party.’ And from that very day on we felt welcome. It’s been an amazing community,” says Dr Pienaar, who is still bemused by the twist of fate and his resulting good fortune. It was good fortune, too, for the health and wellness of the thousands of women in the vast region around Prince Rupert, including Haida Gwaii, Smithers, Terrace, and beyond. As the only OB/GYN in the entire region at that time (a second gynecologist joined in Terrace later), Dr Pienaar for 25 years has done it all: high risk pregnancies and deliveries, C-sections, infertility diagnosis and treatment, reproductive health, cancer diagnosis and treatments, menopausal care, and more – a true generalist practice. He also supports family doctors who care for women with low-risk pregnancies, do deliveries, and assist with other reproductive health issues for women in the region. That ability to innovate is showcased by a new postpartum clinic that Dr Pienaar spearheaded with support and funding from the Specialist Services Committee (SSC), a joint partnership of the Doctors of BC and the BC government. The clinic follows up with women who have had specific pregnancy complications that put them at higher risk for health problems down the road. The stress of pregnancy on a woman’s body is a unique window into her future health risks, especially for cardiovascular disease. “Pregnancy gives us a unique time to intervene proactively into women’s lives. Until now this knowledge has been collected during pregnancy and then discarded,” says Dr Pienaar. Six conditions that can arise in pregnancy are especially relevant: pre-eclampsia, hypertension, gestational diabetes, placental abruption, preterm birth, intra-uterine growth retardation, and excessive weight gain. Now every woman in the region identified as having one of those six conditions during pregnancy has her information entered into a registry. She is then sent an invitation to attend the clinic 6 months after the birth. There, she is given a thorough medical exam, lab tests, and advice and counseling on how to reduce her risks of future cardiovascular issues. Smoking cessation counseling, weight loss advice, blood sugar management, and more are all provided to empower the women to intervene with healthier lifestyle choices perhaps 20 years before established heart disease becomes her fate. A report summarizing her testing and results is sent to the patient and her care provider for further follow-up. Dr Pienaar hopes the ongoing results will help this type of postpartum preventive health service become a standard of care in all locations across BC and Canada. The concept is being picked up in other locations in North America, but Prince Rupert is the first rural location. So far, however, the success is encouraging. Of the women who showed potential risk factors in pregnancy, 75% attended the postpartum Maternal Health Clinic for follow-up and counseling, a remarkably high rate. So here’s a big thanks, from the women of the north coast, for the life-changing power of not looking at the elevator button you are pushing. 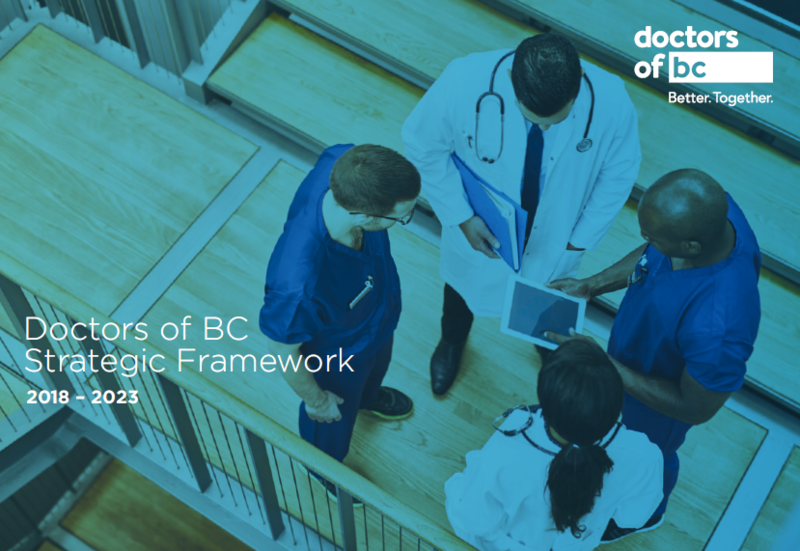 Doctors of BC is interested in profiling physicians you know who are making a positive difference for their patients and in their communities. Drop us a line at communications@doctorsofbc.ca with your suggestions.